As Fernando Alonso and Sergio Perez lined up in eight and ninth places on the starting grid at Sepang last weekend, not even their respective mothers would have predicted confidently they'd be in the front two at the race's conclusion. This held even as the rain fell in the minutes before the start: for all we talk about rain's ability to act as a leveller, and to shuffle the usual running order, its ability to do those with any regularity is over stated. Usually, the cars that have grip in the dry will also have grip in the wet. And shock results in rainy conditions that we remember, such as Olivier Panis's 1996 Monaco victory, often owe more to attrition or other freak occurrences than to an unlikely candidate having the legs of the field all being equal. 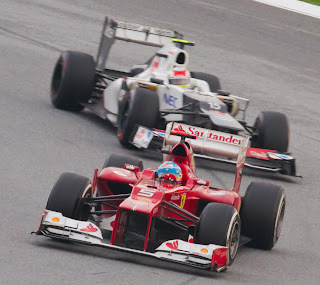 This wasn't the case at Sepang: Alonso and Perez against all expectations were fairly and squarely the quickest two guys out there in the race. Finding a performance on pace which ranks as a similar surprise is a tricky business. Giancarlo Fisichella's run to second place in the Force India at Spa in 2009 was a similar turn-up, as was, famously, Sebastian Vettel's pole and win in a Toro Rosso at Monza the previous year. Before that, for a comparable shock you may have to go back to Damon Hill's dominant drive in the Arrows in Hungary 1997, which would have been rewarded with a win but for a last lap hydraulic problem. In other words, the 2012 Malaysian Grand Prix will be one that we will remember. There are always lots of young drivers with promise in F1. The key differentiator is exactly how good they are. For every Ayrton Senna there a dozen or two who transpire to be good without being top drawer (think Heikki Kovalainen, Jarno Trulli and the like), and even a few who can altogether (such as Stefano Modena and Jan Magnussen). Sergio Perez - A star born? Another youngster with promise, Sergio Perez, went a long way to answering the question of just how good he is last Sunday. Yes, there is a long way to go for him, a lot of his star remains a potential one and many other 'promising' young drivers have had false dawns. But Checo's attacking, smart and skilled drive at Sepang bore all the hallmarks of those 'star is born' performances that happen very rarely and go into the memory, such as Vettel's at Monza already mentioned, as well as Senna at Monaco in 1984. And this follows on from many impressive, and above all adaptible, runs in his year and a bit in F1 already. And it's timely. Perez is a member of Ferrari's young driver programme and it's hardly a secret that a race seat at the Scuderia alongside Fernando Alonso in 2013 is up for grabs. The odds on this seat going to Checo shortened considerably during the Malaysian race, and some speculate even that he'll be racing a red car this year. If and when that move does happen we'll know exactly how good Sergio Perez is. The image of Sebastian Vettel that we are often presented with as the smiling, cherubic, happy-go-lucky kid isn't the whole story. Those who have observed him closely in operation will tell you of his core of steel and strident side that, when called for, is deployed to ensure that his chances are maximised. There was perhaps some of this at work in Seb's behaviour during and after the Malaysian race, in relation to contact with Narain Karthikeyan's HRT as he was lapping him, which consigned Seb to a finish out of the points. Having punctured in the clash, Seb gestured ferociously at Karthikeyan and then in post-race interviews called his fellow driver an 'idiot' on British television and a 'cucumber' for the benefit of the German media (which I'm told roughly translates as 'a clumsy person'). But equally you could contend that Seb's actions were a small revival of a side of his we thought purged long ago: namely someone prone to ill-advised public commotion when the going gets tough. If it is the latter, it's perhaps worrying that, with two championships in his pocket, it took only two races of having a good, but not the best, car for such frustrations to show. And whatever the case, while I can forgive the gestures (as they were done in heat of the moment) I don't care to hear an F1 driver refer to another as an 'idiot' (and this wasn't heat of the moment - plus he conveyed the sentiments more than once). I especially don't care to hear it from the world champion. While the stewards decided it was Karthikeyan to blame for the contact that struck me as an absurdity and if there was any blame it had to lay with Vettel, who moved onto Karthikeyan's line early. And if nothing else, the move was imprudent from Seb. There was little to be gained for him on any level by moving back to the racing line on the straight so promptly, and as he found out he had an awful lot to lose. Lack of judgement when wheel-to-wheel is another side of Seb we thought purged long ago. Which brings us neatly onto a general point: the extent that backmarkers get out of the way of leaders when being lapped these days. Blue flags have existed since the year dot, but the current practice of cars slowing markedly and leaping out of the way as soon as one lapping them gets close, on the pain of a penalty, is relatively new. Sometime within the mid to late 1990s it became the norm. To some extent it's easy to see why this is: this way battles for places aren't disrupted by cars much slower and not in the same race (as it were) getting in the way. But an unintended consequence of this is that the art of being quick moving through 'traffic' has been lost. Ayrton Senna was a master, and his ability in clearing backmarkers was pivotal to many of his 41 wins. A similar ability was also crucial to Michael Schumacher's first two drivers' titles. And while many backmarkers were gentlemanly when approached by a car a lap ahead, some were notorious for not being so. The names of Andrea de Cesaris and Rene Arnoux spring to mind immediately. And clearing them was part of the F1 driver's skill set. And further, the gap on pace between front to back in F1 currently is very close by historical standards, so in the past there was often much more lapping for the leaders to do. To take an extreme example, had the HRTs, proportionately, been as far off the quickest qualifying time at the 1992 British Grand Prix as they were in Malaysia Q1 they would have qualified P6 and P9! That's ahead of both Ferraris and Martin Brundle's Benetton. 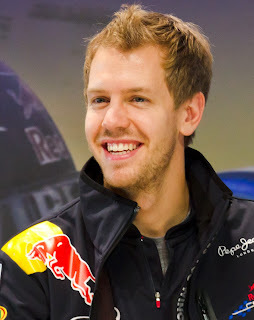 Both Vettel and his boss Christian Horner expressed outrage at Karthikeyan after the Malaysian race, and claimed that it was his responsibility to get out of the way as a much slower lapped car, pretty much no matter what. Taking the expanse of F1 history they should count themselves fortunate. Will the real Lotus please stand up? Before the first race of an F1 season nobody knows anything. Now, two races in, a pecking order both for qualifying and the race is emerging. 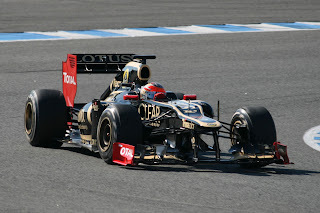 One team that have yet to completely 'pull down their pants' (as Seb might have said) however is Lotus. It's clear that the E20 is a rapid machine, and there has been a considerable bounce back by the Enstone squad after a traumatic 2011. Indeed, they appear to be firmly at the sharp end on qualifying pace - in both rounds a Lotus has qualified only around a quarter of a second shy of the pole time. But, due to circumstances, we don't know how good they are in a race. In both meetings thus far Romain Grosjean has qualified well but barely lasted a lap of the race. And while Kimi Raikkonen has finished both races, and looked pretty racy as he's done so, in each he's qualified much further down than he should have been, thanks to a goof-up in Melbourne and a grid penalty in Sepang. Given a trouble-free weekend in China it will be fascinating to see where they finish up. It could well be that race wins for them this year are not out of the question.